Discovered in 1817 by Friedrich Stromeyer at Göttingen, Germany. 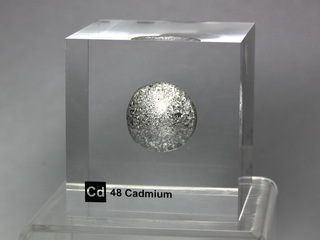 Cadmium is a white metallic element. It is readily accessible as it occurs in concentrated ores and is easily extracted by heating the oxide with carbon and distilling the metal. It has an abundance in the earth's crust of 0.11 ppm. 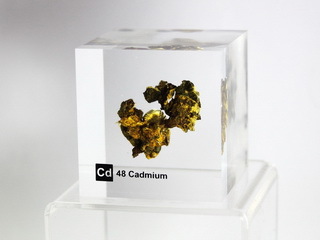 Cadmium has been used in applications as diverse as plating, the manufacture of batteries and as a yellow pigment for paint. However, its high toxicity means that its use is now becoming increasingly restricted.